I’m asked a lot of questions about kit, which is a little bit ironic because bushcraft, fundamentally, is about knowledge of nature and what you can use from nature. Most of us go out with at least basic equipment, most of the time. We typically don’t go out in just our underpants, building a natural shelter every time we go out camping. We’re going to take some equipment with us, particularly if the purpose of our trip is to move from A to B.
We’re going to take a tarp. We’re going to take a sleeping bag, or a hammock, or a tent. We’re going to take those things with us so we’ve got a shelter ready to go, and we can erect it quickly at the end of the day. 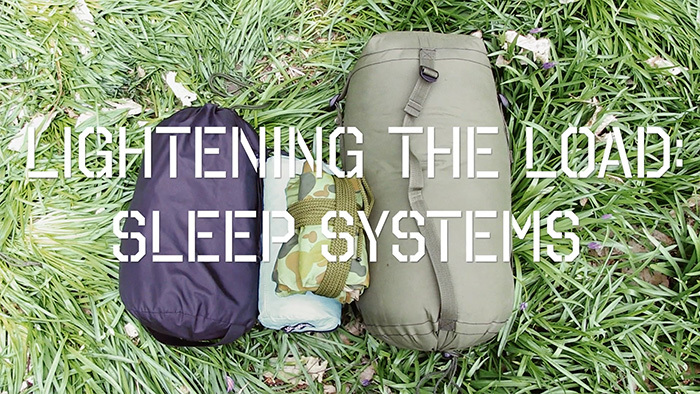 While hiking, canoeing, or any other trip where the main aim is to cover some ground and make a journey, we’re typically going to take sleeping equipment with us. The video below is the first in a series that I’m going to make about how to lighten your load, because that’s really the question people are asking a lot of the time when they ask about kit. They’ve seen my video about packing kit. It shows how to pack things relatively compactly. They’ve seen my article about what to take for a basic bushcraft-style camp in the woods. So, what I want to do in this series of videos is to share ideas and options that will help you lighten your load while maintaining the functionality of your kit. And the place to start, with the kit you need for going beyond a day hike, is with the items that you’re almost always going to have – unless you decide to go out and build a shelter and sleep out in that way – that is sleeping kit. So we’re going to look at sleeping systems first. I’m concentrating on tarp and bivvy set ups here as this is the classic woodland camping option. You can really make some significant savings to weight and bulk by utilising well chosen, well designed sleeping systems. You can also watch this video on YouTube here. For those who have difficulty hearing, there is a full transcript of the video available via the link below. 1.39 kg Exped 12 LXW. 1.81 kg Wiggys Hunter ultralight sleeping bag, and pillow. I used to have an ultralight Rab goose down bag, sleep on a piece of tyvek, or window pane covering, on a short superlight exped, which just went to my hips, and weighed about half of my present set up. A small MLD tarp, which weighed next to nothing. So Ive gone the other way and Im very happy with it. Sleep all through the night. Sleep better than in my own bed. The only problem is you never want to get up. Thanks yet again for another great video. I must admit I watched it as much for reassurance as I’ve just gone through the same process, a couple of different brands but you’re spot on regarding the over engineering of the solution, the “just in case” approach and I’ve taken kilos out of my kit – I haven’t taken a bivy bag I’ve trusted my tarp rigging perhaps I’m being too confident as 440g is probably worth it for the extra confidence. Another very informative video. I’ve certainly seen some ways to cut down on weight, thanks very much. I do have one question, do you put your sleeping mat inside your sleeping bag? I did last time I was out as I kept sliding off of my mat when I had it between my Bivi and my sleeping bag. I found I was sweating a bit more though! Another good topic covered, thanks Paul. I can vouch for the snugpac SF Bivi bag, I’ve done a 5 and 7 day trip with it this year and it is very good – central half zip as well which really helps getting in and out. I was concerned with possible ground punctures, but just had the thermarest outside and put a couple of stakes at chest and knee height to stop me rolling off during the night (I fidget a lot). Also, any recommendations for a central zipped down bag? Have you checked out some of Alpkits bags?I believe some of their new down bags have centre zips,lightweight,nicely priced, and good quality?(Alpkit.com). Any thoughts on 100% wool blankets? Its also worth noting, that many people mention their kit weights, without mentioning how much they weigh. Your kit weight should be noted as a percentage of your own body weight/mass, otherwise its a bit meaningless. Doing percentage only really matter if one is wearing larger than average clothing or tents; or participating in hobbies which demand more equipment (eg. hunting, rafting, skiing). Most of the gear lists with weight classifications (10 lbs, 20 lbs, 40 lbs) of base weights assume a male who wears medium-sized clothes. Two men go for a hike. Both men are within the acceptable healthy weight for their size. Both men are fit. Both men are carrying kit weighing 12kg. One man is 5’7″ and weighs 9 stone. Who is carrying the heaviest kit? How are you defining “fit”? My point was that in the example above, the shorter lighter man is carrying 21% of his body weight. Whilst the larger man is carrying just 13% of his body weight. Thankyou for posting the vid mate. So in essence, the weight of the pack is dependent on the purpose of the trip. The longer the excursion, the more emphasis on going lighter hence why thru-hikers are obsessed with gram-counting. The more gears one carry, the more emphasis on going lighter hence why mountain hunters obsess with gram-counting. Mountaineers are obsessed with gram-counting for the same reason, although the reason is more related to the hazards presented in their situation and the need to reach the summit and bail as quickly as possible. But sometimes there are circumstances even with all the gram counting, we still have to go outside our comfort level of 13 – 14 kg packs (with food and water, of course). How long a winter trip (without resupply) will be is dictated by how much food one can carry. That’s when body weight percentage really comes into play. Wouldn’t really matter. Boy Scouts ambassadors noticed for a long time, most people are comfortable with backpacks no more than 30 lbs (13.6 kg) in total including food and water. It doesn’t matter how old they are or how fit they are. Even the old-timers like Colonel Townsend Whelen advised not to have a base pack more than 15 lbs (6.8 kg), and he himself touted 10 pounds (4.5 kg) between 1920s and 1950s. But his strategy made sense because he was chasing moose, sheep, elk and goats during his time and it makes a lot of sense to minimize the pack weight when one knows they are going to be hauling 36 to 90 kg worth of meat per trip back and forward to the outfitter’s base camp. The weight percentage comes more into play when people start carrying more gears than what is required than a normal 3-season hiking trip. The weight percentage really come from those studies done on infantry to see the effectiveness of troops carrying combat loads. The military have a vested interest in ensuring their soldiers are not overloaded. But again, we are talking about a sector where it’s not uncommon for young men to come out of service with disabilities as the result of heavy loads. Even the ultralight movement in backpacking world is more of a byproduct of a very specialized sport called thru-hiking where people are expected to hike 4 000 km within 150 days and oftentimes people will go for two weeks without resupply, so basically they are carrying about 9 kg of food and water with them. Hence why some of the evangelicals advocate for sub-4.5 kg for the entire backpack. So, to me, the only reason why it matters to do weight percentage is if the entire backpack, including food and water, is over 14 kg for any occasion. For instance, let us suppose a wife and husband decide to go hunting in Alaska, using the weight percentage it might be determined that the wife cannot carry more than 31 kg, and the husband can’t carry more than 61 kg, and both have backpacks of about 15 to 16 kg backpacks including binoculars, spotting scopes and rifles. So, at that point, it might be determined the wife will haul back 16 kg of meat back to the base camp the first trip, dump the content of her pack and come back to haul 30 kg (since hunting packs tend to be around 2.3 kg) per trip, while the husband will haul back 45 kg the first trip, dump the contents and come back for 58 kg meat loads until the entire carcass has been evacuated from the kill site. But most people are not willingly carrying more than 13 kg unless there are no other alternative options (eg. combat loads, meat hauling, canoe portages, meat loads, unsupported Arctic treks.) The hikers and campers who do carry a lot of weight tend to be inexperienced, and the more they walk, the more likely they will ditch weight. The ones who still insist on carrying heavy loads are more orientated toward camping than walking or hiking; and that’s okay. Everyone has a different idea of what constitutes as fun. So really, doing bodyweight percentage for loads under 13-14 kg doesn’t make a lot of sense, unless one finds him or herself in a unique situation. I apologize for not proof-reading. Just realized the sentences sound somewhat incoherent. The textbox is not exactly friendly for long explanations. No mention of a quilt? They are cheaper than sleeping bags, half the weight and are just as warm. I can sleep in mine down to -10 C with only a thin baselayer on and a closed foam sleeping pad. Sleeping bags only really come into being in winter. Going to see if I can find 6″ stakes for a weight saving of 7 g per stake, replacing the Nite Ize with Lawson Glowire or Ironwire and the poles with Locus Gear CP3 or Black Diamond Alpine Cork Carbon. Bug season? Head net if I am solo, or an innernet (340 g) if I am with someone. What a top idea for a series of videos. I particularly valued your comments around the summer bag you’ve been using because you gave its comfort and limit ratings with your ‘real-world’ experience of using it, in comfort, from early April. Great video, shared it on our Scouts page, a little late for tomorrow’s Expedition……I have to say though that big blokes hold their body heat a little more than us slim(ish) ladies so you haven’t convinced me to ditch the 4season at this time of year (I had thick socks, leggins and merino on the other week!). We’ve just bought Hunka bivvy bags for all the family and they have performed wonderfully in the garden micro-adventures (quite damp, with tarp in the rain and also open to the stars), really breathable and fitted my synthetic 4 season, they even coped with my youngest’s bag which is a Gelert Pod (because it was enourmous and pink!) They have a really small packsize and are light, 376g. Look forward to the others but would appreciate a bit more info for us smallish ladies and our cold feet! Can I ask which Hunka’s you have used, normal or XL. As we are looking at investing in some for our Troop, but as they all use huge synthetic bags I was concerned about the internal size/volume in them. We use the normal. However, the Gelert Pod (you can fit many teddies in that one!) was scrunched up, but my daughter is a thin 8year old, there was a sheepskin as well in there! I forgot to put the Hunka on the other night and she was back in the house shivering at 3am so it clearly makes a big difference. All the other bags were synthetic and bulky but worked well. We are a fairly slim family and no one is over 5’10”. Money well spent in my opinion but you need to make sure the Troop treats them with respect! Hope this helps. PS. Seemed to missed out that it was Alpkit Hunka in case anyones looking. Thanks very much for a great video……….some very good advice. I’m doing much more hiking and wild camping and this should help a lot. The weight is a big factor but just as crucial is the size………unless you want to look like a giant snail!!! Another excellent video. I look forward to more on this subject. As my soubriquet suggests, I’m in my mid 70s, so no longer as young and fit as I once was- laid up with sciatica at the moment instead of being out there as I would normally be at this time of year. This is not a bid for sympathy but to emphasise the need to go light not only when older but also to avoid future problems by not carrying too much as I did when younger: I suspect the current weakness in my knee and hip goes back to a strain injury sustained on a trip in the Alps in the 1980s caused by carrying a too heavy a pack. I’ll be interested to learn how you get on with the lightweight bivvy-bag Paul. I used one of those for about five years but probably for no more than a total of 12 weeks all together. You might remember me being pretty unhappy one morning on Intermediate Bushcraft because I got wet feet & wet sleeping bag. This was down to a fairly major failure of my bivvy-bag; the tape on the seam at the foot had come away & quite a lot of the membrane had worn through (and I’d never worn boots in that bag). Plenty of water got in through the stitching and worn parts. I think that bag will do fine for occasional use, but I think you’d wear it out no time. I also got pretty fed up with the zip snagging! I’ve been using the same three season sleeping bag as you all winter, no snow I’ll admit, but several heavy frosts in November and December. And I have been too warm several times even with no clothes on in the bag under a tarp. Definitely no need for an Arctic / 4 season bag in the southern UK. I’ve just got home, just an hour ago, from a night in the woods and was almost too warm in the Snugpack SF1 summer weight sleeping bag. I think you’re spot-on with your advice and view that people tend to over-specify the kit they use. But lightweight kit can be seriously spendy! Not stuff you’d buy for occasional use or when starting out though. I admit my backpack is getting too bulky most of the time so I’m looking for to down sleeping bag and DD superligt tarp to save weight. Also I have the thermarest prolite as sleeping mat and it is serving me very good. Thank you very much to give us so focused video. Thanks for the great video Paul, love the gear videos. Now to Google the bivvi you are talking about. Fantastic video, very helpful, been using the Cuban tarp / sin-nylon for quite a while now very lightweight for a long time I found it difficult to get my hands on a good quality one. They seem to be easier to get in the United States but are becoming easier to pick up over here now. I love the snug pac bivi its tiny compared to my mod bag, will have to try that. Looking forward to your other videos, as always I get a lot out of your videos sometimes its comforting to know im on the same wavelength with packing gear as you, and its good to see what im doing wrong or ways to improve personal kit options or packing ideas. bit of a random question Paul, but how do you get your aussie tarp to roll up so small!? I cant seem to get mine anywhere near as neat! I still enjoy your posts Paul, keep up the good work. It’s easier to show than to describe in words but the general steps are to draw the tarp up in the middle of the ridgeline like a set of curtains, folding it in pleats. Once folded flat, roll the tarp from nearest the ground, up to the ridgeline. Then release one end of the ridge line and wrap it around the tarp, tucking the end through to hold it in place. Then at right angles to the first wrapping of cord, wrap the other end of the ridgeline (remember the tarp was roughly in the middle to start with) around and tuck in to hold tight. If completed correctly, you’ll end up with a tidily packed tarp such as the one I showed in the video. how long do you think the tarp will last? cheers for all the great info. Keep up the good work! Sorry to comment again so soon Paul, but where did you buy the good quality Australian hootchy tarp? I need a long term tarp you see. Thanks again. Hi Fox, I bought it from a supplier in Australia. If you Google Auscam hootchie, you’ll find a number of suppliers. Just a brief thank you for all the helpful advice. This is good, clear and well written advice. I live in gran canaria and bivy out a fair bit. Mix either a warmer down or more generally a 7 degree c mountain equipment synthetic bag with an army bivy. It rains so rarely here I don’t use a tarp. It’s a bit of a bivy paradise really. Temperature about 7 degrees at 1400 metres in april/may, obviously much warmer as summer rolls on. If I had one question it would be how useful do you find basic mosquito head nets for sleeping. Flying things seem to have gotten worse this year and I got bitten a few times last week on my most recent trip. Obviously my army bivy doesn’t have a mozy net. Thanks again for what has been a great series of reads to ight. Glad to have found your blog. I found it reading one of your anugpack reviews. I haven’t used the bags but the snugpack advanced patrol poncho is a great light waterproof option that covers your pack as well. I wonder if you’ve ever tried one.